On March 7 we welcomed over 140 individuals, primarily comprised of staff from our member organizations, for the Cultural Alliance’s first Diversity Equity and Inclusion (DEI) Workforce program, Painting a Picture of a More Diverse & Inclusive Arts and Cultural Workforce. The event, featuring presentations and interactive breakout sessions led by regional thought leaders in DEI and HR, was held at the African American Museum in Philadelphia. 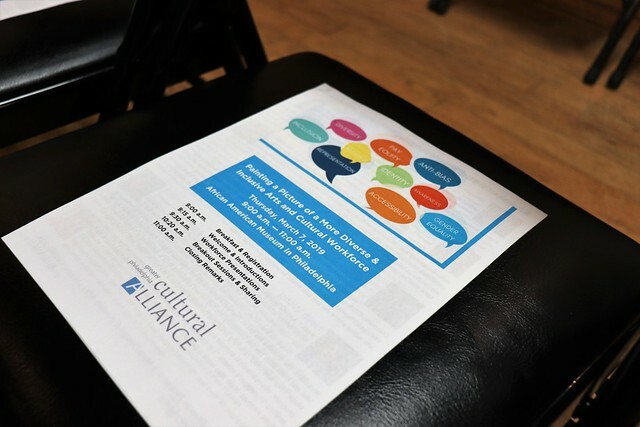 During this rich and robust conversation, attendees learned about ways that arts and cultural organizations can begin or continue to build practices, establish talent pipelines and discuss innovative ways to further diversify their workforces. Specifically, topics such as the inside perspective of diverse applicants throughout the hiring process, value of Employee Resource Groups, necessity of funding for DEI work, importance of paid internships, and borrowing from for-profit models for best and most effective DEI practices were addressed. The Cultural Alliance would also like to thank our event sponsor, Wawa, for their recognition of our DEI efforts and making this event possible. For more information about the Cultural Alliance’s DEI Initiatives, our ongoing work, and how to be involved in this work, please visit our DEI page.